I made this bow and arrow using only primitive tools and materials.The bow is 1.25 m (55 inches) long and shoots 60 cm (2 feet) long arrows. I don't know the draw weight - safe to say greater than 15 kg (35 pounds) perhaps? The stave was made from a tree that was cut with a stone axe and split in half with a stone chisel. I don't know it's name but it's common here and is the same wood I use for axe handles. One half was used for the bow and was cut to a length of 1.25 m (50 inches). The limbs of the bow were carved with various stone blades so that the limbs tapered in width, and to a lesser extent depth, towards the tips. The middle of the bow was narrowed in width to form a handle about 12.5 cm (5 inches) long. The string was made from the inner bark of a fibrous tree. It was separated into thin strips and left to dry. Then it was twisted into cordage. Arrows were made of the same wood as the bow and were 60 cm (2 feet) long. A notch was carved into the back to accept the bow string. They were fletched with bush turkey feathers picked up from the ground (no turkeys were harmed in the making of this video). A feather was split in half and cut into 3 lengths then resin and bark fiber attached the fletching on to the arrows. 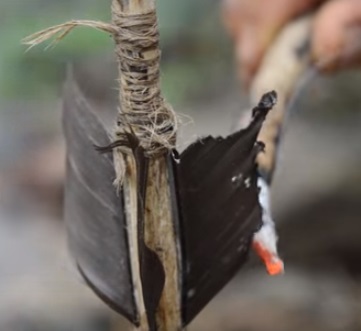 The tip of the arrow was fire hardened and sharpened to a point. The fletching was trimmed using a hot coal. Each arrow took about an hour to make. A quiver was made of bark to hold the arrows. I cleared a shooting range with a semi rotten log as a target. At 10 meters the accuracy was better than 50 % for this narrow target and the arrows stuck into the wood enough so that they were difficult to pull out. The bow was durable, shooting about 200-300 times with the string breaking only 3 times. I made a back up string and repaired them by splicing the ends back together. In conclusion this was an easy bow to make. The short design makes it easy to find a straight piece of wood for the stave. A short string is also easy to make and short arrow shafts are easy to find. Short bows shoot fast and are easy to carry in thick forest. The dimensions of the bow were based on those given in the SAS Survival Handbook by john Lofty Wiseman. but instead of carving it from a stave from the start, I split the stave and then carved it. I think this requires less time, effort and skill. It also gives a flat bow design that's unlikely to break. It does require wood that doesn't twist much when split though.